The Unbelievable Uglies are a rock and soul and rhythm and blues show band that formed in Detroit Lakes, MN, in 1963. The original members were Dave Hoffman (Winston Fink), Detroit Lakes, vocals, upright bass, keyboards and trombone; front man Dave Prentice, Detroit Lakes, guitar and bass; Gregory J. Paul, Detroit Lakes, lead guitar; Bob Eveslage, Frazee, vocals keyboards, trumpet and guitar; and Mike Shannon, Frazee, drums. Early additions to the band were Allen Spears, trumpet, guitar and vocals; and Dr. Paul Lidstrom, trumpet, keyboards and vocals; both from Detroit Lakes. The original band was called Robbie Jay and the Unpredictable Uglies. 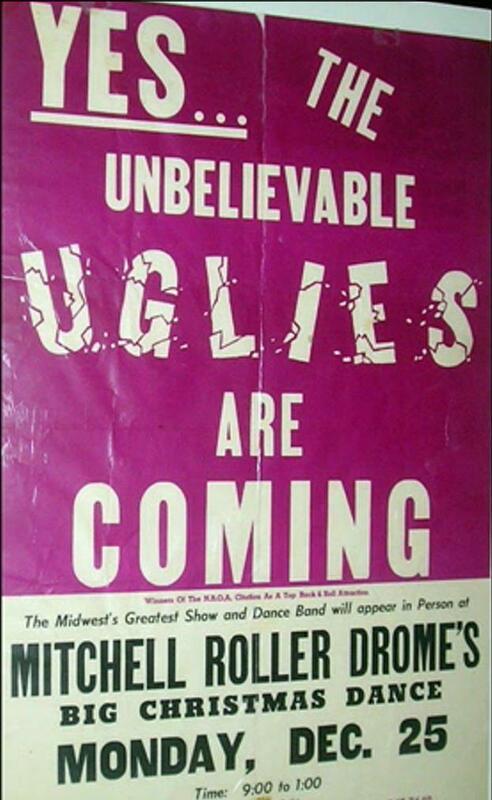 By the summer of 1964 the name was changed to The Unbelievable Uglies. The Uglies played somewhere in the Upper Midwest almost every weekend and 45-60 extra shows in the summer. They played repeatedly in at least 22 dance halls and cities in South Dakota. The bonds of friendship among the members was extraordinary. The young musicians were dedicated to the music to entertaining the crowds with their raucous, unpredictable performances. The band won the National Ballroom Owners Association award three years in a row. In 1964 The Unbelievable Uglies issued their debut single, "Judy Angel," backed with "The Log." Soon after this, Bob Eveslage left the band, moved to Seattle and issued a solo single, "The Days When I Knew Judy," under the name Robbie Jay. In 1967 he moved back to Minnesota and rejoined The Uglies. The band released "Off My Hands" and soon after signed with Soma records with their single, "Keep Her Satisfied." The records got enough regional airplay to land the group a deal with Liberty, and early in 1967 they released their major-label debut "Sorry," produced by Bobby Vee. Soon after that, the Uglies released the Spears-Eveslage composition "Spider-Man." Other recordings were "I Ain't Gonna Eat Out My Heart Anymore" and "The Tin Drum." In November 1967 The Who opened its first U.S. tour in Fargo, and the Unbelievable Uglies were the opening act. The show made national headlines when Fargo’s mayor accused both groups of inciting the teen audience to riot and banned them from appearing in his city again. The ban was lifted a short time later, and The Uglies continued to play shows in Fargo. They also played many times in Winnepeg. Two of their avid fans there named the Uglies as their biggest influence when forming their own band, the Guess Who. Burton Cummings and Randy Bachman were two Manitobans who loved the Uglies. In 2005 the original members were inducted into the Rock and Country Hall of Fame in Medina, MN. They reunited and began performing as "The Original Unbelievable Uglies." The band released a CD of new material and toured regionally to support their first new recording in over three decades. Hoffman (Winston Fink) joined the rest of the band in 2005 for a number of shows, but that fall he suffered a major stroke and could not perform onstage again. He continued to help with booking, songwriting, recording, and producing the band. Hoffman died on New Year's Day 2008. Al Spears had died a few months earlier. Mike Shannon, the original drummer, died in 1999. Today the band continues to play reunion shows with Jerry Uchanski on vocals and guitar, Gregory J. Paul on lead guitar, Paul Lidstrom on bass and Bob Eveslage (Robby Jay) on keyboards and vocals. Dave Prentice joins the band when his schedule permits. In addition to the original Unbelievable Uglies 2006 self-titled CD, recent compilation appearances include The Lost Generation, Vol. 2, Mondo Frat Dance Bash a Go Go, and The Big Hits of Mid-America: The Soma Records Story. The band knew and practiced discipline, teamwork and hard work with what they really loved – the music and the dancers. They didn’t drink or do drugs. They just grew up in the ‘60s.